A spy program allows you to monitor or spy any PC from anywhere - without needing to have physical access to that PC with this realtime spy program ! 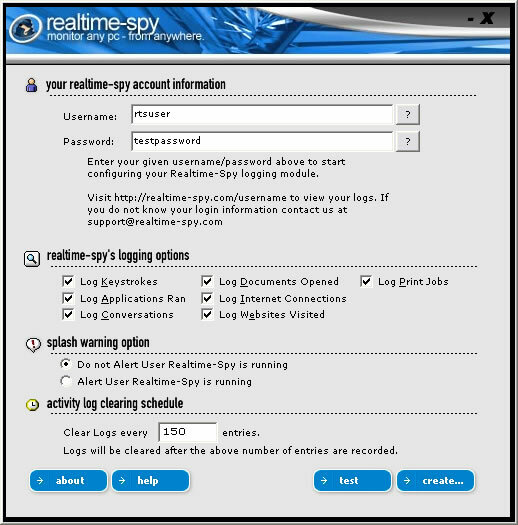 Realtime Spy is the best spy program for you ! Spy Program - Realtime Spy allows you to remotely install the software on any computer as well as view the log files from anywhere in the world via your own personal Realtime Spy webspace! It does not require IP addresses and does not create a direct connection with the PC you are monitoring! Once installed all log files are uploaded secretly to your personal Realtime-Spy account on our webserver. This spy program enables you to view reports in realtime from anywhere in the world. and access to the monitored PC, from any location via your personal website address given to you after you purchase. Spy Program - Realtime Spy - Log and record MULTIPLE PC's from ONE REMOTE LOCATION without any extra configuration - just click what user names you want to view logs for! Usernames are categorized by what PC they are logged under for easy user selection. Spy Program - Realtime Spy - Can monitor any PC regardless of its Internet connection and it runs in COMPLETE STEALTH and cloaks itself to hide from the remote user! The file you send to the remote user is able to be discarded and deleted - without affecting Realtime-Spy's monitoring process! Spy Program - Realtime Spy - Log all keystrokes typed by the user. Logs are automatically pre-formatted from backspaces for easy web viewing via your secure Realtime-Spy webspace and Log all websites visited by the user. Realtime-Spy supports all the popular browsers (AOL, IE, Netscape, Opera, etc). Spy Program - Realtime Spy - Log all internet connections made and attempted by the user. Logs include the remote host/port and local host/port, Log all windows opened and used by the user and Log both sides of all ICQ/MSN 4,5/Yahoo!/AOL/AIM messenger conversations! Spy Program - Realtime Spy - is built with security in mind since it is remote based. Realtime-Spy can operate in complete stealth, can be deployed remotely, and is password protected from outside users. Only you can access the remote PC and all your logs are password protected via secure web encryption. Only YOU can access your secure log webspace to view logs! Spy Program - Realtime Spy - is very easy to use. All activity logs and remote computers can be viewed using your web-browser from any Internet-connected location. Setup is a breeze with our installation guide.